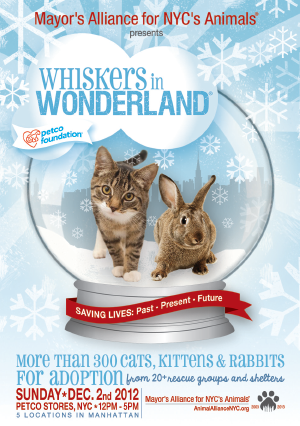 Adopt a Cat, Kitten, or Bunny at Whiskers in Wonderland at Manhattan Petco Stores on Sunday! Don’t miss New York City’s largest pet adoption opportunity of the holiday season! Whiskers in Wonderland, hosted by the Mayor’s Alliance for NYC’s Animals in partnership with the Petco Foundation, will feature hundreds of cats, kittens, and rabbits just waiting to be welcomed into new homes. In return, these furry new friends will give the gift of unconditional love! More than 300 cats, kittens, and rabbits* will be available for adoption from over 20 rescue groups and shelters. Scheduled groups (subject to change) include ASPCA, Bideawee, Brooklyn Animal Action, Brooklyn Bridge Animal Welfare Coalition, Bronx Tails Cat Rescue, City Critters, Empty Cages Collective, For Animals, Inc., Heavenly Angels Animal Rescue, KittyKind, Liberty Humane Society, Linda’s Cat Assistance, Little Shelter Animal Rescue & Adoption Center, NYC Feral Cat Initiative, Picasso Veterinary Fund, Posh Pets Rescue, Rabbit Rescue & Rehab, Sean Casey Animal Rescue, Staten Island Hope Animal Rescue, Union Township Animal Shelter, Tavi & Friends, A Winters Tail, and Washington Heights Cat Colony. * Note: Rabbits will be available at Union Square, 86th & Lexington, and Columbus Square locations only. Rock & Rawhide will collect donations of pet toys and clean linens for shelter animals. Enter the Whiskers in Wonderland Sweepstakes! Enter for your chance to win a $100 or $300 Whiskers in Wonderland Petco gift card! Share your personal link with your friends and earn more chances to win.